It took about two minutes from the time Senate President Steve Sweeney certified the passage of the millionaires tax package for Gov. Chris Christie to veto the bills at his desk. After the state Senate passed the bill, which had already passed the Assembly, Sweeney walked the bills down the hallways of the Statehouse, from the state Senate chambers to the governor's office. Once inside, he handed the bills to Christie, who was waiting. "What took you so long ?" asked Christie spokesman Michael Drewniak. Christie sat at a wooden desk emblazoned with the seal of the state of New Jersey and swiftly signed vetoes. "We'll be back, governor," said Sweeney. "Alright, we'll see," said Christie. 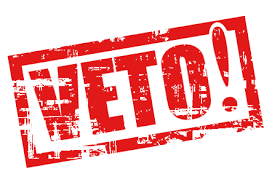 Democrats would need two-thirds majority in both houses of the Legislature to override the veto. "This is something we're not going away on," said Sweeney. "This isn't theater, this isn't a gimmick." New Jersey Governor Chris Christie may have set a record for the speediest veto in American history on Thursday when he rejected an income tax surcharge passed by the Democratic legislature two minutes after it arrived on his desk. That bill would have resurrected former Governor Jon Corzine's "temporary" income tax surcharge on millionaires that expired at the start of this year. Democrats want to reinstate a top tax rate of 10.75%, up from an already high 8.98%. Mr. Christie stated what is obvious to every taxpayer in the Garden State not on the public payroll: "New Jersey does not have a tax problem; New Jersey has a spending and size of government problem." Trenton gained virtually no additional revenue by raising the income tax rate in 2007. Imposing the third highest income tax in the U.S. (after Hawaii and Oregon) didn't prevent a $11 billion budget deficit. Democrats nonetheless played the class warfare card, tying the increase to a reduction in drug co-payments by seniors. They argue that Mr. Christie is merely protecting a privileged few—16,000 New Jersey millionaires—from paying $637 million more in taxes to "share the pain" of balancing the state budget. Share the pain? New Jersey is already dependent on a handful of rich tax filers to pay the state's bills. The richest 1% of filers in New Jersey pay a little under half, or 46%, of all state income taxes. Inviting those with the highest tax payments to pack up and leave for states that are less hostile to business and wealth will only send the state into a deeper fiscal ditch. The real privileged few in New Jersey are government unions that have soaked taxpayers to finance their oversized pensions, health-care benefits and salaries. Democrats hope that by raising taxes on the rich they can inoculate their union allies from Mr. Christie's effort to reduce the advantages that government workers have over private workers. As one example, Mr. Christie notes that many state employees "pay nothing for their health benefits that cost, for family coverage, between $18,000 and $25,000 a year. No one in the private sector has that kind of deal." In 2004, New Jersey increased in the top income tax rate, which applied to those earning over $500,000 per year. Between 2004 and 2008, the state saw a net decline in household wealth of $70 billion. Further raising taxes on high earners – and small businesses – would do little to reverse the outward migration New Jersey has seen over the past ten years.